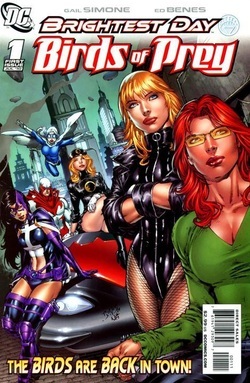 Before becoming an ongoing series in 1999, the concept had to prove itself; in June 1996, Birds of Prey launched as a single-issue special titled Black Canary/Oracle: Birds Of Prey #1. The standalone story garnered enough sales to convince DC to publish a 4-issue mini-series, Black Canary / Oracle: Birds of Prey: Manhunt (September-December 1996). On the letters page at the end of Birds Of Prey: Black Canary/Batgirl, another special, Siege, was solicited, but it was never published; DC greenlit an ongoing Birds of Prey series and Siege became an arc later on. While the previous follow-ups had launched at an interval of approximately every six months, Birds of Prey went nearly a year between the publication of Birds Of Prey: Black Canary/Batgirl and the first issue of the ongoing (Vol. 1, Jan 1999). Birds of Prey is a comic book series published by DC Comics (1999-2009) that ran for 127 issues. This series features the adventures of the heroine Oracle and her group of super-heroines. Birds Of Prey: Secret Files & Origins. Oracle: The Cure - (#126-127). 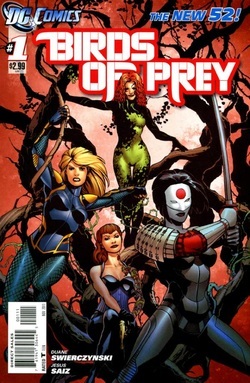 This second volume of Birds of Prey was launched under the Brightest Day umbrella of titles. This series ran for 15 issues, from 2010-2011. Birds of Prey: The Death Of Oracle - (#7-13). Birds Of Prey (Vol. 2) #14-15 (final issues) have not been collected. A ''New 52'' title starring a re-imagined Birds of Prey. This iteration ran for 34 issues, from November 2011 to October 2014. Vol. 5: Soul Crisis (#25 & 27-34).